Digging Up The Marrow is the latest film by Massachusetts’ Director Adam Green. It is a mockumentary inspired by, and featuring the monster art of Alex Pardee. It stars Adam Green, and the rest of the Ariescope (Green’s film company) team, as themselves. And Ray Wise as a potentially insane, monster obsessed ex- police officer. Who believes that he has proof of the existence of actual monsters, that live underneath a cemetery. Ray Wise is phenomenal as per usual. Adam Green is as approachable, nice, and funny, as he is in real life. The rest of the cast as well. If you enjoy Green’s show Holliston, this is right up your alley. It was great seeing genre regulars; Directors, and Actors popping up as themselves. It sheds a light on Adam Green’s professional life, whilst still in the realm of the mockumentary style. The practical monster effects are amazing, and in great abundance. This was a tough one to review, I must admit. Very out of the box, than Green’s previous films. But I enjoyed it quite a bit. It made me jump a couple times, and that’s a plus in my book. Also the use of practical effects, yet another plus that always wins me over. I love monster movies, and monsters, about as much as Green describes he does in the film. So it’s a win in my book. 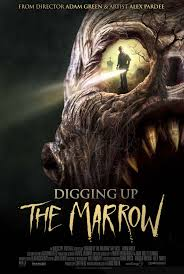 Digging Up The Marrow is available now on DVD, and Blu-Ray.